Rio de Janeiro is a beautiful city, and I enjoyed the beaches and fabulous views during my visit in August. 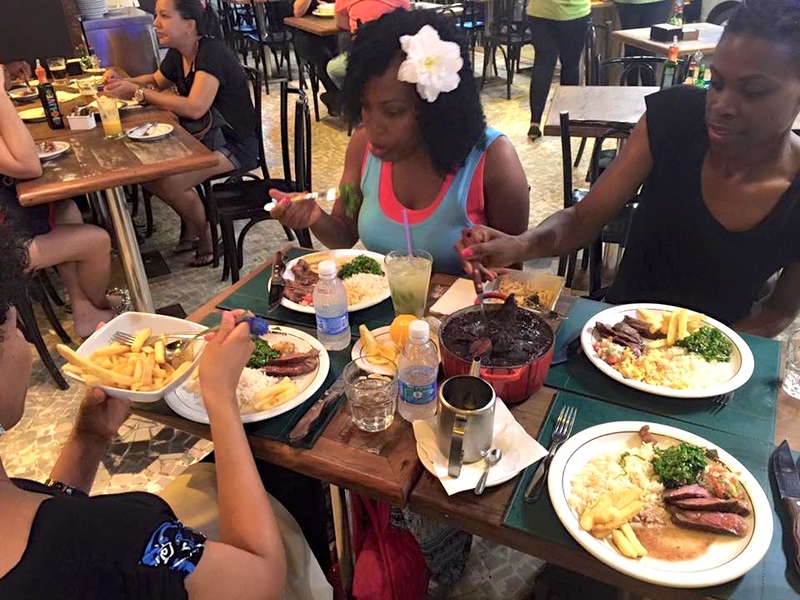 There is good food in Rio but you have to know where to find it. One popular dish in Brazil is a comforting, delicious meal called Feijoada. This black bean stew includes pork and meat, which provides rich flavor. Rice, mustard greens, and a cornmeal dish are served along with it, making it very hearty. I mixed all of the flavors together and it was incredibly satisfying and comforting. 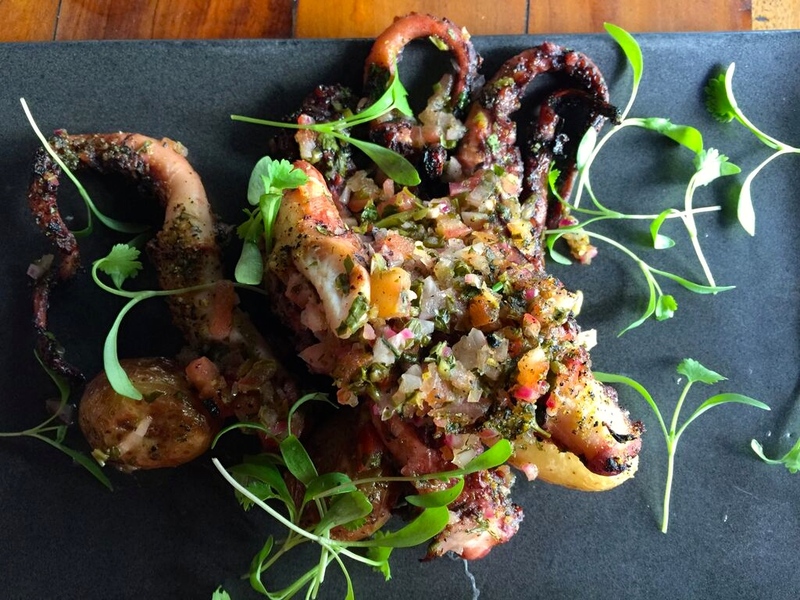 My friends and I had this dish at a restaurant called Boteco Belmonte in Rio. This would be a great dish to make on a cold, Chicago fall or winter day – now I just need to find a good recipe! 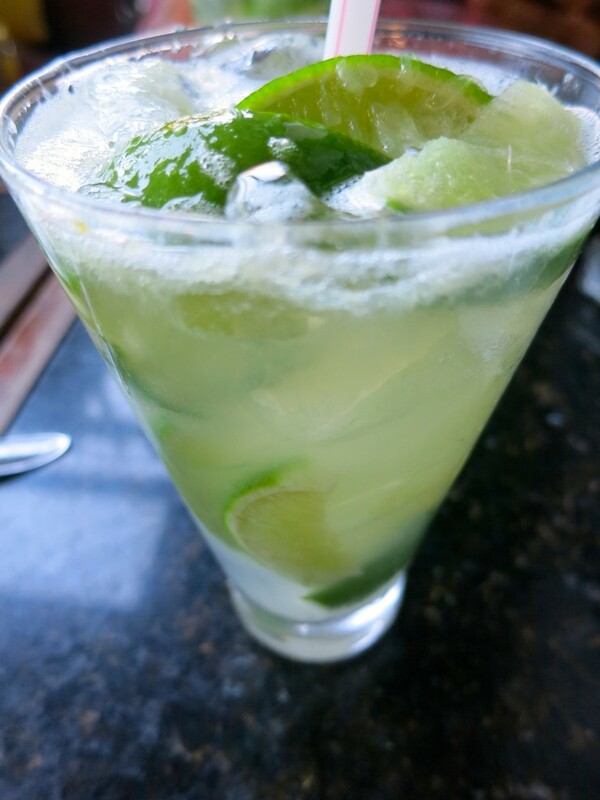 The national cocktail is the caiprinha drink, which is mixed with cachaca (similar to rum), sugar, and lime. The best ones are found on the beach, where they are nice and sweet with a kick, and incredibly inexpensive compared to bars/hotels. 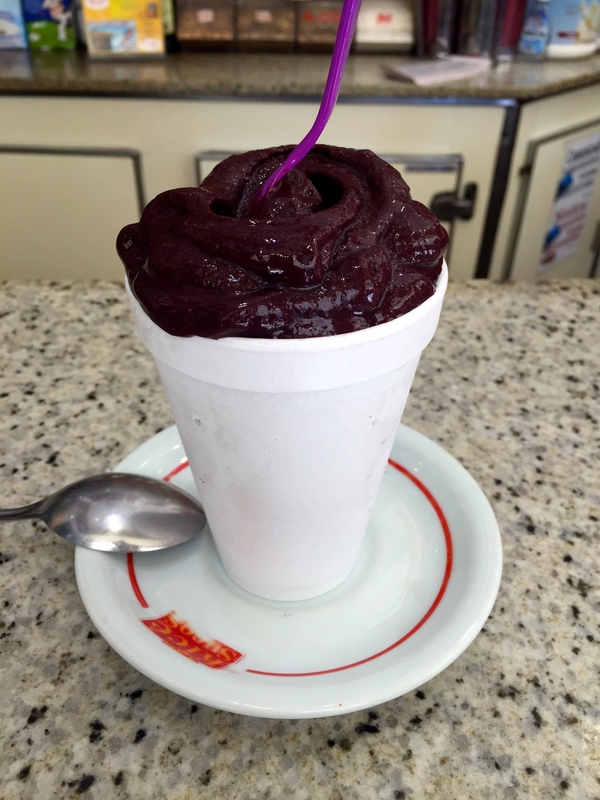 Another wonderful treat in Brazil are the corner juice bars. They make juices and smoothies and they are absolutely delicious. They offer a number of different fruits, and one of the popular flavors was Acai – which is a superfruit rich in antioxidants. I had mine blended with banana, and it can be thick enough to be served with a spoon. You can also make a bowl of it and eat it with granola to add some crunchy texture. Brazil is also known for it’s steakhouses, and there is steak everywhere. Shrimp was on many of the menus as well. 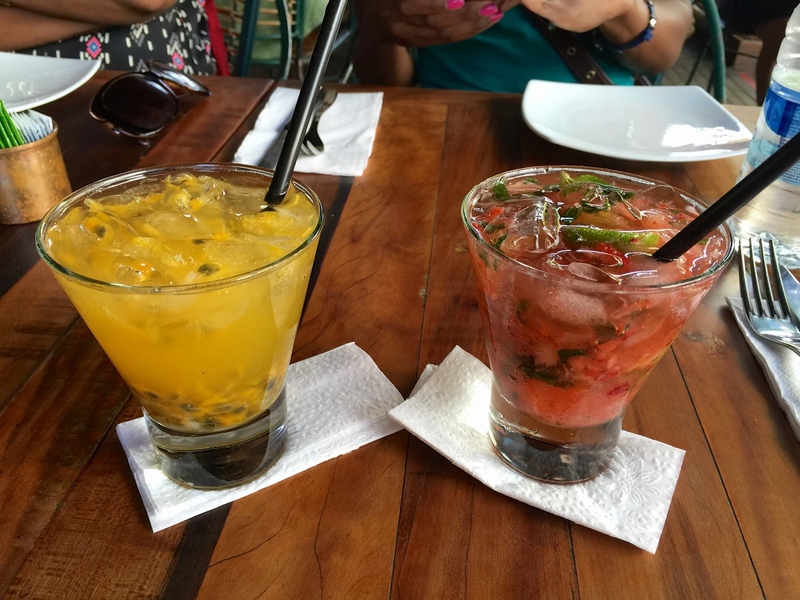 Being Americans, we really like having some variety in our cuisine, so we sought out a couple of other non-Brazilian restaurants that did not disappoint. I happened to find Santa Satisfacio restaurant on Yelp. As much as people/restaurants sometimes say bad things about Yelp, I really like to use it as a tool to find good restaurants, even when I’m traveling internationally. This Italian restaurant had some great reviews, and Yelp didn’t steer us wrong. The food was AMAZING. 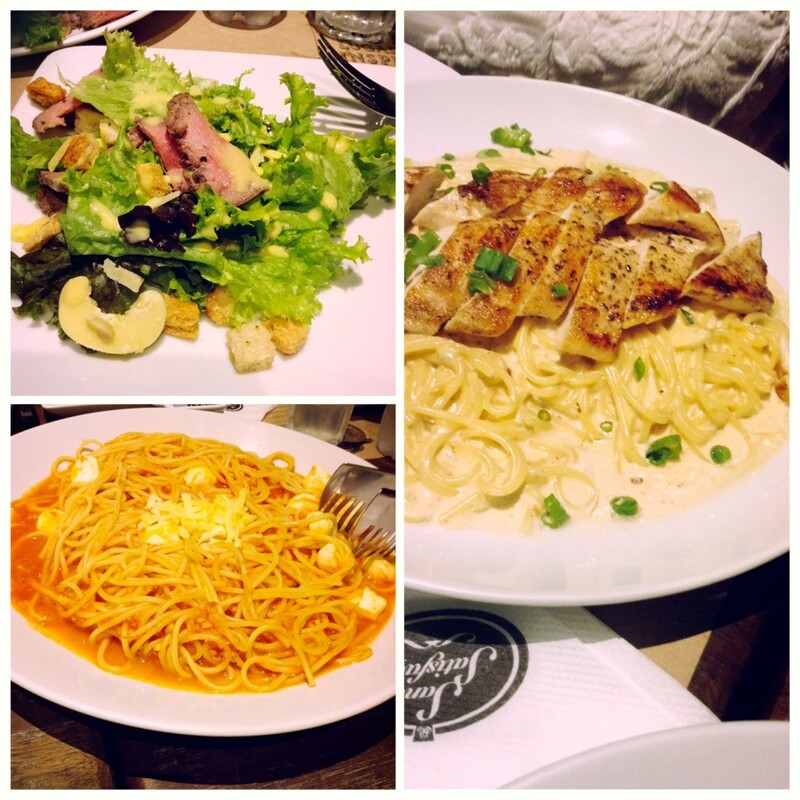 I can honestly say that it’s the best Italian food I’ve had in a long time. The salads were very creative. We had a garlic pasta alfredo dish where all of the flavors were incredibly well-balanced, and a tomato-based pasta dish as well. Highly recommended. If you happen to be visiting Rio, I would highly recommend this restaurant. It’s small and quaint with a trendy vibe and it was a participant in Restaurant week there. Check out this link to see pictures of their food. Amazing pasta at Santa Satisfacio! – Learn some basic Portuguese. People in Rio don’t speak English like you may find in Europe. There may be only one person in a restaurant that knows English. A good way to learn is through an app called DuoLingo. It’s free and a lot of fun. You can learn a language for 5 minutes a day if you are diligent. – Stay in a hotel that offers beach services, including umbrella and chair set-up, towels and water. This makes your life so much easier. We stayed at the Pestana Rio Atlantica Hotel on Copacabana Beach which has these services included and it was great. – Go to the Spa at Belmond Copacabana Palace as soon as you land. Don’t delay. Run, don’t walk. I had an amazing massage there. The next time I go on an international trip, the Spa is going to be my first stop! When my friend asked me if I wanted to visit her in Europe, I immediately said yes, as I love to travel. We decided on Barcelona on Thanksgiving weekend, and the best part is that I was able to use airline miles and hotel points for a virtually free trip! Barcelona is a cosmopolitan city that offers amazing food, art, history & shopping. It’s pretty easy to navigate once you understand the lay of the land. I would highly suggest getting on one of the hop-on hop off tours as soon as you arrive to get a feel for where everything is located. I stayed at the trendy DoubleTree Hotel, and enjoyed the location and the great service. Lunch in Barcelona starts around 2pm and dinner starts around 8-9pm, so the eating schedule takes a little getting used to, especially when you have jet lag like I did. Between 2-4pm is siesta where people take their lunch breaks and rest. This mid-day break is taken very seriously as many stores close during this time. 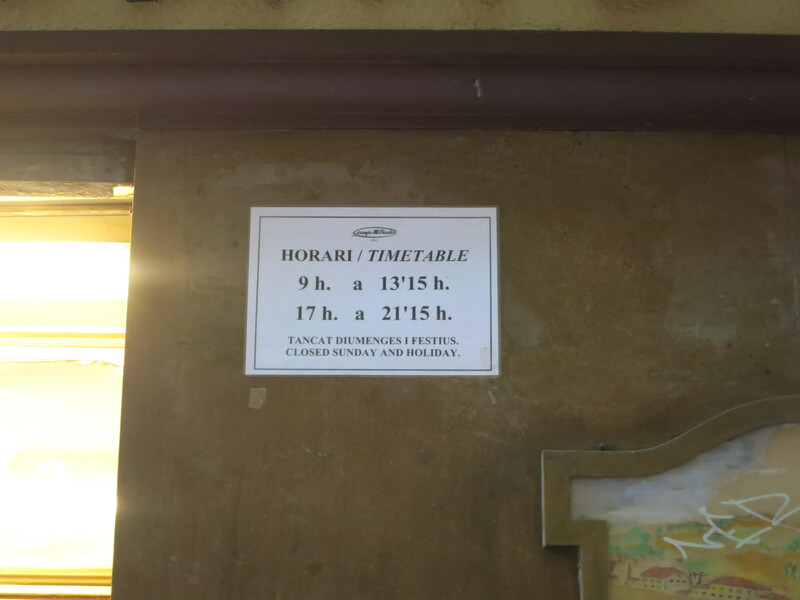 It’s very important to pay attention to store hours on the outside of buildings when in Barcelona, especially if it’s a small shop or boutique. I went on a Gourmet walking tour, which was quite informative. 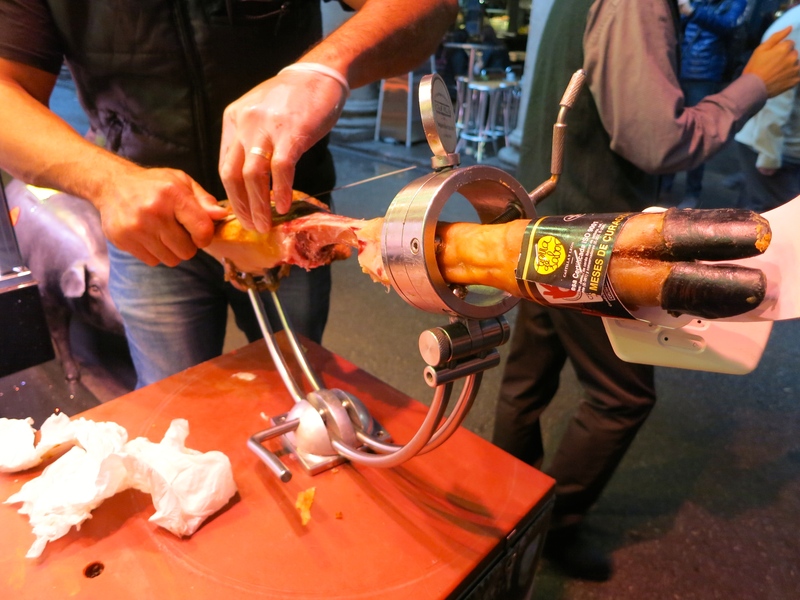 The food that you see in Spain truly ties into their history. One pleasant surprise was the huge number of French bakeries and pastries available, as Spain was under French rule for two centuries, and the food stayed (yes!). I enjoyed getting croissants and tea as my breakfast in the morning.The first place I visited to eat was Cafe Emma, which was a bistro on Pau Claris – thoroughly enjoyed it! Ham seemed like the national food there, and I learned that there are 2 types of ham, black hoof and white hoofed ham. The black hoofed ham is raised on the countryside and is considered to be of higher quality. It generally has less fat than ham with the white hoof. The black-hoofed pigs are fed acorns and are encouraged to run, which results in a high-quality piece of meat. 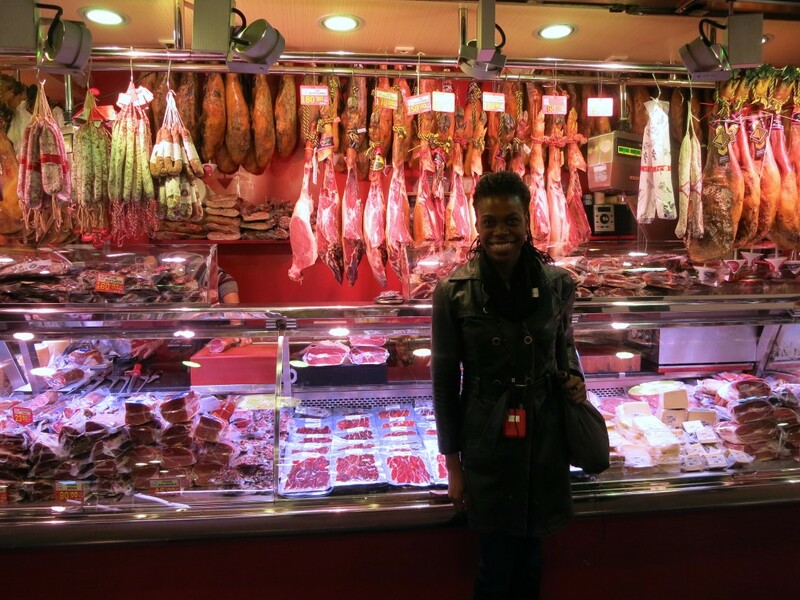 I went into the La Boqueria food market, and was shocked to see ham laying there with the hooves still on them. (As Jimmy Fallon says, “ew!”). At first I was grossed out, but after learning more about it, I understood that the hooves are on them so that you can know the level of quality you are getting. In Barcelona, there were a number of restaurants offering Pinxos (pronounced “peen-chos”). The idea of Pinxos is quite genius. They are basically small appetizers on top of bread with a small stick in it. You go in, get a plate, grab the food you want, and then when you are finished, the waitress/cashier will count the number of remaining sticks you have for your final price. This is great because if you just want a little snack, you could just get 2-3 pinxos for about 5-6 Euro. There were also dessert Pinxos available, which gave me some party ideas. A Pinxos restaurant concept would be great in the city of Chicago – especially in the loop where people don’t have a lot of time to devote to lunch. 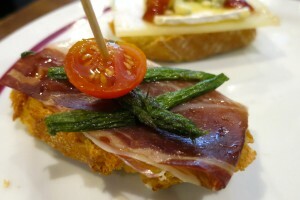 As far as tapas are concerned, the restaurants in Barcelona offered many of the same tapas that you may see in American restaurants, but they taste much better. I had the best Patatas Bravas that I’ve ever had IN LIFE. 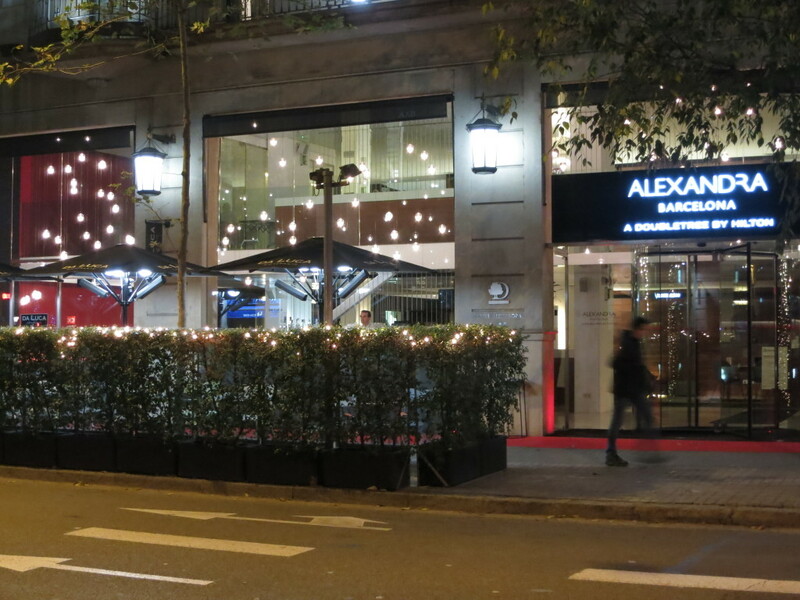 If you get tired of tapas and pinxos, there are other cuisines available in Barcelona. We stopped by Thai Barcelona for some Thai Food, and the food was good, and the ambiance was absolutely gorgeous. I will say that the food was a bit pricy – around 18 Euros for an entrée, but it was a nice experience. Another restaurant that I enjoyed visiting was called Cornelia and Co. the ambiance was very laid back and relaxed, and the food was good (although they had small portions). Good place to go if you are dining alone. They had a good mix of cuisines, including Spanish and Italian food, and I tried this Catalan dish with bread where you rub garlic on top, drizzle olive oil and sea salt on it, then squeeze the juice of a tomato on it. Delish – although I ended up smelling like garlic for a couple of days. The woman who sat next to me in the restaurant showed me how to do it. 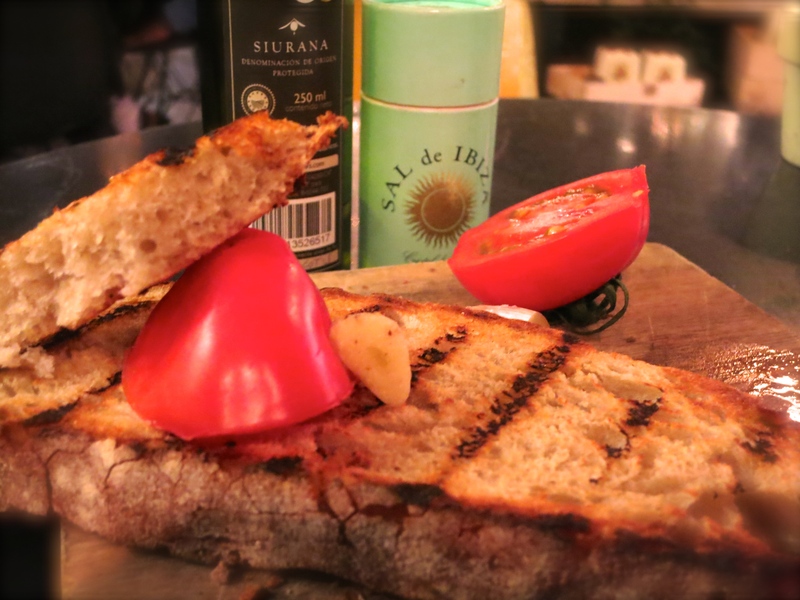 Catalan bread and olive oil with tomatoes, and sea salt. Delish! Below is a video where you can see some of my adventures. Enjoy!! Sign up for Taste Bud Diaries Newsletters! Adventures in Hong Kong and Shanghai! Weber Grill’s Refreshed Spring Menu!